Now back up a bit. 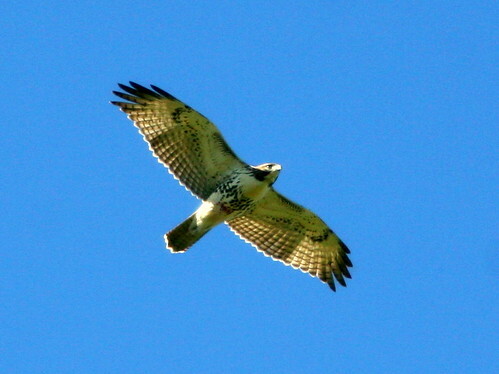 Can you identify this hawk– er, raptor in flight? Now let’s step way back and try again. Naturally, I thought that the color of the tail had sealed its identity. It was, after all, a “red-tailed hawk,” pure and simple. I noticed it looked clear underneath, but thought that maybe Florida had some Red-tails that were even lighter than those I knew out west. Patagial markings? Belly bands? Were they all that important? It had a RED tail. Case closed. I took its picture, and then tried to ignore a nagging doubt. Only after I viewed the hawk on my camera’s LCD screen did I realize it was a species that I had never seen before in its light plumage variation. Its tail contains no red pigment, and the red color is attributable to back lighting and diffraction. 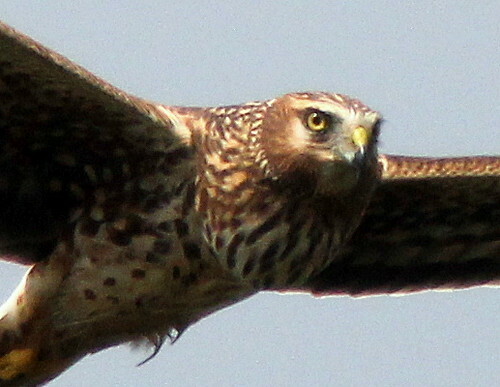 Click on the thumbnail to obtain a better view, and learn the hawk’s identity. The following hawks are displayed as thumbnails, to introduce my review of Jerry Liguori’s Hawks at a Distance. As a warmup for my review of this book, here are a few more of my images of “hawks” in flight. Test your ID skills. No cheating– do not “hover” over the images until you are sure of your ID. In the fall of 1961,when I was an intern at Mountainside Hospital in Montclair, New Jersey, our chief of thoracic surgery was Dr. Adrian Sabety. (who passed away only last month in Sanibel, Florida at the age of 95). Dr. Sabety was an ardent birder, and he invited me to accompany him on a visit to a nearby hawk watching site. It occupied undeveloped land on a ridge in the Watchung Mountains. The site was accessible by means of an overgrown trail, and upon reaching the top, I was amazed to take in an unobstructed view of the sky in all directions, including the full skyline of New York City.. Even more impressive was the skill of the small cadre of hawk watchers who called out the identity of the raptors as they were carefully tallied. I returned several times, with my latest copy of the Peterson Field Guide in hand, trying to sort out the hawks as they flew over. It was fairly easy for me to distinguish the many Broad-winged Hawks from non-Broad-wings, even at some distance. Except for identifying vultures and the occasional Red-tailed Hawk that flashed its tail color, this was about as far as I was able to advance my skill set. The Montclair Hawk Watch has since become an official sanctuary of the state Audubon Society, and it enjoys the distinction of being second in longevity only to Pennsylvania’s famous Hawk Mountain. 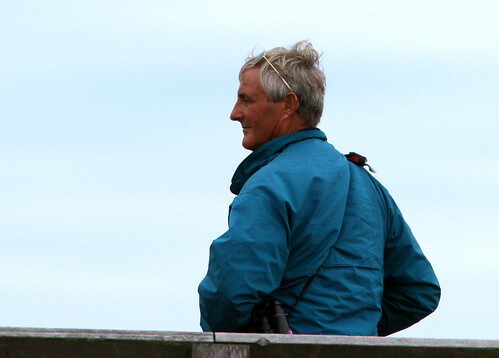 My last visit to Cape May, New Jersey coincided with the 2009 fall Hawk Watch. 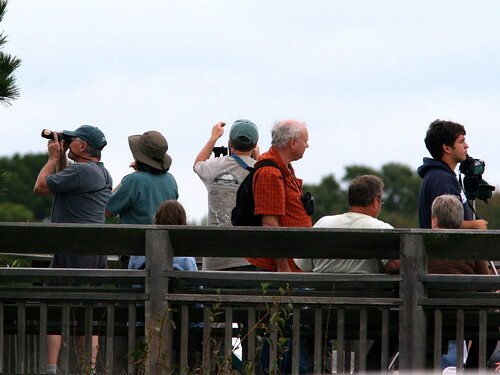 The observation deck was crowded with watchers, armed with binoculars, spotting scopes and cameras. A continuous stream of southbound raptors appeared over the horizon. Often the hawks appeared as specks above the distant horizon, at first only visible to one or two people. Binoculars turned the little specks into larger specks. Pete Dunne was there, acting as a coach, pointing out identifying features, such as the more powerful appearance and swift direct flight of Merlins as opposed to kestrels. Relatively few of the hawk watchers had the confidence (or the braggadocio) to call out the identity of the specks in the distance. Keeping my opinions to myself, I actually picked a Merlin out of the crowd, and watched it pluck a Tree Swallow right out of the air and carry it down to the lighthouse for a leisurely meal. No one else knew, but I only had about 50% success in telling big female Sharp-shinned from small male Cooper’s Hawks– a flip of the coin would have done as well. 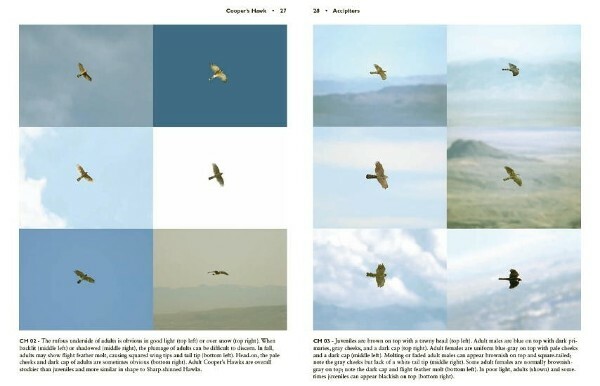 Jerry Liguori’s Hawks at a Distance: Identification of Migrant Raptors is certainly a book for aspiring as well as veteran hawk-watchers. But, is it a book for a recreational birder like me, who rarely encounters a kettle of Broad-winged or Swainson’s Hawks, and is intimidated by the robo-watchers atop the mountains and lookouts? My short answer is yes, and let me tell you why. 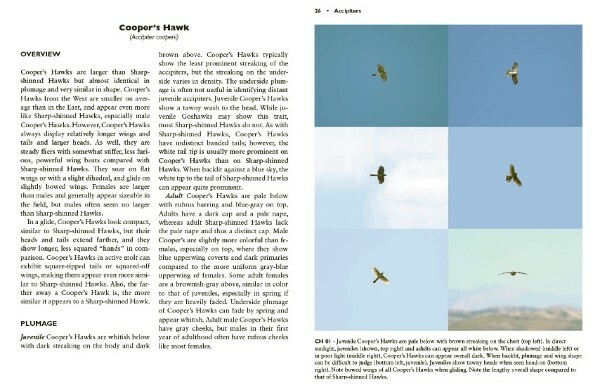 The book is unique in that all the birds are photographed in flight. 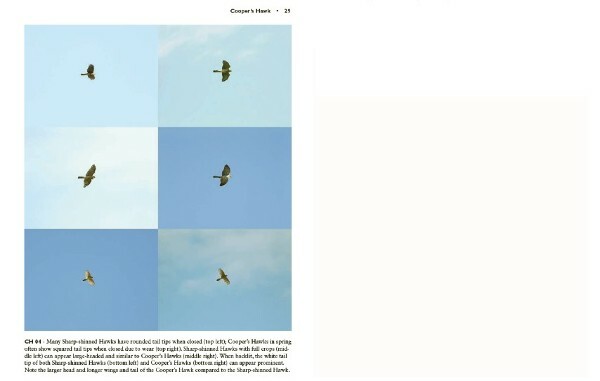 Except for the full page color plates that introduce concise descriptions of each of the 20 raptor species most commonly seen in established hawk watching sites, the color photos are tiny, usually six to a page with lots of sky in between the images. An additional nine less common migrants are also described and depicted in distant flight. The hawks are seen, not only from below, but coming at you and going away, from the side and sometimes from above. At the back of the book, individual pages with over 40 black and white photos are devoted to each species, illustrating the bird as semi-silhouettes in every conceivable flight posture and alignment. As I initially leafed through the array of images, many looked identical to me, as if all were taken of the same bird, no matter what species I was looking at. I realized that browsing this book did not yield much useful information. 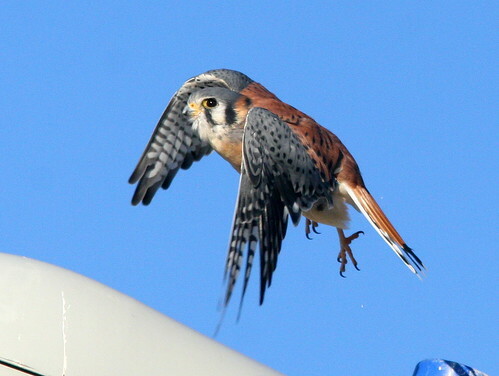 I took a different tack, and started reading the sections on particular raptors that were most familiar to me: kestrels, harriers, Red-tails, Red-shouldered, Sharpies and Coops. On the first reading of the descriptions, I paid special attention to statements in bold text. Now the book began making sense, at least for the hawks with which I had some experience in observing. As I read and re-read the sparse text, the tiny photos started to come alive. The finer points of identification became relevant and interesting. Now I cannot wait to test my memory in the field and look at some old friends with new appreciation. This book reminds me of the manual that came with my new camera. I skimmed the online version before I ordered the camera, and referred to it again before the camera arrived. Then I browsed through the paper manual when it came in the box, trying to memorize the names, positions and functions of all the buttons, dials and displays.Still, the first time I used the camera, it seemed I had forgotten nearly everything. However, after just that one real-world attempt, the advice in the manual took on new meaning and importance. Each time I go back to it I have a question or a problem that needs resolution– but my visits to the camera manual are less and less frequent. Hawks at a Distance (Princeton University Press) lists at $19.95 for a sturdy paperback edition, but may be purchased from Amazon.com at a discount. A Kindle version is also available. March 26th, 2011 at 10:27 am The real challenge down here in SW FL are the immature Buteos i.e. juvenile Red-shouldered Hawk vs juvenile Broad-winged Hawk and even juvenile Red-tailed Hawks. Try getting some photos of those bad boys and then hone your skills!